I was thinking about diving into the growing pile (figuratively speaking) of early-2018 releases that are amassing but I felt guilty about the records from this year that I still hadn't fully listened to yet. This album from Australian black metal band Ignis Gehenna caught my attention a while ago, due to it's artwork. 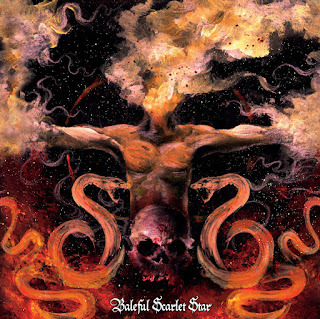 The mysterious entity released "Baleful Scarlet Star" on cd via Seance Records in January and it was released on ltd tape via Sahluqtu Archives in July. I appreciate that I'm a bit late in writing this review and I apologise for that. Music is timeless and so life should be. Trepidation is often felt when pressing play on an album such as this, but that feeling is banished as soon as the warm, orchestral sound of opening song Serpent Oracle envelopes you. It’s not orchestral in the obvious sense, but the guitars and drums offer a soundscape that is close in both layers and textures. The recording and production/mastering jobs have given it a really full sound and the vocals sit perfectly in the centre of it all. It makes you realise that there’s more to black metal than just raw lo-fi hatred. Ignis Gehenna’s sprawling songs are more than just rehashes of a genre exploding. The title-track’s percussive battery reigns down on your ears, while the riffs provide sinister melody to back up the rasping screams. The fact that this body of music is both stark and relaxing is testament to the creative mind (or minds) behind Ignis Gehenna. Edict Of Blood is the first of two songs that pass the ten-minute mark and it’s a joy to behold as it winds it’s way through a barrage of everything that make black metal great. It’s catchy in places yet obscure enough to make norms grimace. The subtle folk melodies are great as well. There’s a real sense of urgency about Melas Oneiroi, with a tempo that leaves nothing standing in it’s wake. The metallic majesty on Litany Unto Thanateros is impossible to ignore. It was that sound that I described as orchestral at the beginning of this review and it’s brilliant. Litany… is the second song that stretches beyond ten minutes, but don’t worry if you have a predisposition for short spans of attention, because it’ll keep you hooked throughout due to IG’s musical variation and song-writing skill. Closing song Anamnesis takes a leaf out of Oranssi Pazuzu’s book of dissonant black metal during it’s intro. The rest of the song retains IG’s own brand of enigmatic noise, but this time it’s wholly instrumental and it serve them well. It rounds out a spectacular album that deserves wider praise and indeed audiences. Why stay with the tried and tested when you can explore the more obscure corners of the genre and come across Ignis Gehenna. I know what I’d rather do.